Ah, The Witness: a game I just can’t quite put down. 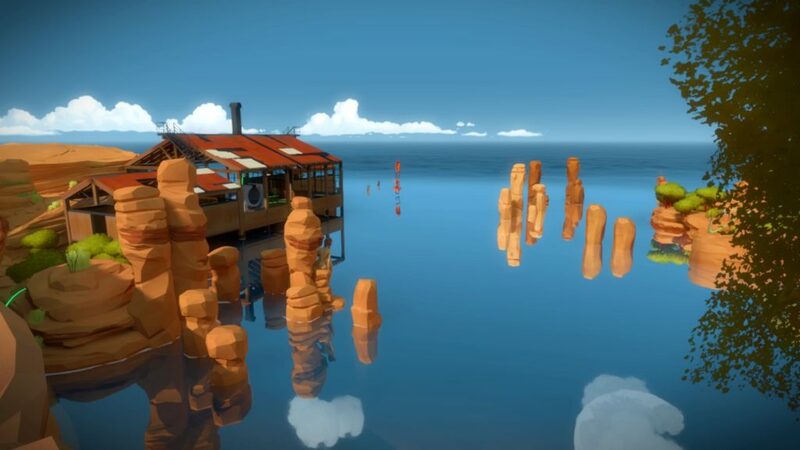 The Witness is a puzzle and exploration game created by Jonathan Blow, the man behind the time-bending puzzle platformer Braid (which originally released on Xbox Live Arcade in 2008). The game is mostly comprised of boatloads of maze-like puzzles in which players must determine and trace the correct path.This game is enjoyably challenging and a lot of fun to explore. The game hinges on a simple mechanic but features a wonderful variety of puzzles, the vast majority of which are interesting and rewarding. Attention to detail is superb and the island is so tightly packed with secrets and mysteries that you will find yourself looking for patterns in everything. That said, the game still suffers from a story that’s barely told and the occasional frustrating or unfair puzzle.Before I dive into the breakdown, I want to make note of something: many other reviews of this game implore their readers to avoid using guides and to play the game unassisted. While I partially agree, I don’t think it’s necessary to insist that the “right” way to play the game involves forging on alone.I do, however, have a different piece of advice: if possible, play it with a friend. I played nearly all of the game with my significant other we were able to put our heads together to get past tricky parts. Don’t worry, we still got stuck plenty of times, but two people trying out ideas got us past the roadblocks faster and helped us improve our understanding of the puzzle mechanics. So if you’re into teamwork, grab your significant other, your roommate, or your friend and just hang out together while you play. Even just a passive spectator will find themselves saying “Ooh! Can I try something?” before too long, and it can be a lot of fun to tackle challenges together.Now that that’s out of the way, I’ll break it down. I want to get this category out of the way first. The “Art” category of my reviews encompasses all things that are non-gameplay related: namely, visual art, sound and music, and story or narrative. So I’ll break it down further accordingly. It doesn’t take long to be impressed by the beauty of The Witness’ world. Every tiny piece of the world is lovingly designed and gorgeously rendered in bright colors. The world is an absolute joy to explore and look at. Thanks to the developers’ attention to detail, it holds up surprisingly well to the level of scrutiny it falls under as players seek to unravel its mysteries. My biggest criticism is that most of the world is often too static. A little more movement in the world might have been nice. In terms of sound, this game is extremely minimal. There’s no music, and ambient sound seems to appear only when it’s necessary. As you play you’ll find little recorders that read quotes from philosophers and writers, and this makes up pretty much the only dialogue (or rather, monologue) in the game. I think the purpose of the silence is to lend a lonely or serene sense to the world, or maybe to emphasize the sounds made by interacting with the various puzzles and mechanisms in the game, but it all feels a little too quiet and monotonous to be simply trudging around to the sound of your own footsteps. And finally, the narrative. While I’m certain there is a carefully thought-out backstory to this quiet island, I found the game to be infuriatingly unwilling to convey it. All you get are glimpses and pieces. The recorders strewn about the island offer absolutely zero explanation about the game’s background, instead choosing to mire themselves in philosophical musings that I could only presume must be alluding to some sort of larger concept that I simply hadn’t figured out. Many of these quotes spend long minutes pontificating vaguely, and while many of them are interesting they still feel silly and out of place. Even when solving all of the main sections of the island and then completing the game, The Witness never really invites you to experience its story or themes in the same way it invited you into its puzzle solving. Finishing the main game felt like being given 20% of a jigsaw puzzle and then being told to “just try to get the gist of it, okay?” I think there’s a lot of metaphorical and thematic content to digest, but it never felt like the game wanted me to figure it out. This may be a divisive aspect of the game, because some may enjoy chewing on these themes and symbols, but I found myself pretty alienated. 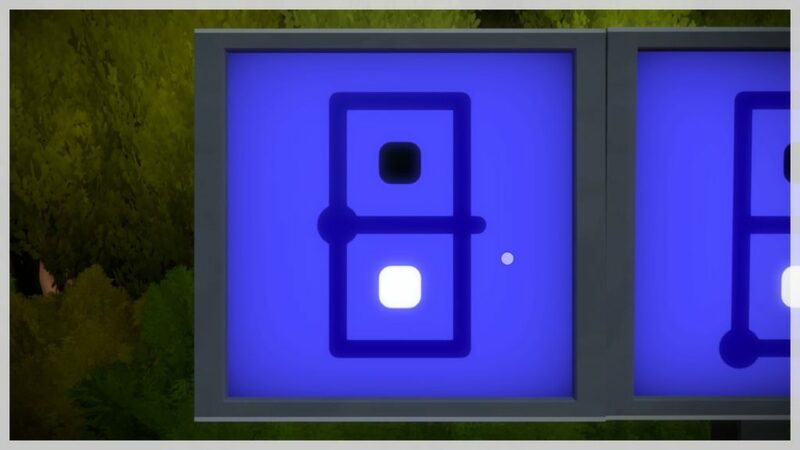 The Witness has an extremely minimal interface. While roaming the island, you basically just walk around and solve various puzzles by pressing a button to enter a special puzzle line tracing mode. In this mode you can no longer look around or move but only draw lines on what’s in front of you. The game occasionally forces you to solve puzzles at strange angles, and since the speed at which your cursor draws is based on its distance from your face, it can be an annoyance at times. Aside from that, however, I have no qualms with the way the game controls or feels. Its minimalism helps lend the player a solid understanding of the tools at their disposal. For example, I was initially frustrated by the inability to jump in a first person game, but as I played it became clear, that no jumping helps prevent ambiguity. I’d never have to wonder if I could make a jump in order to get somewhere. 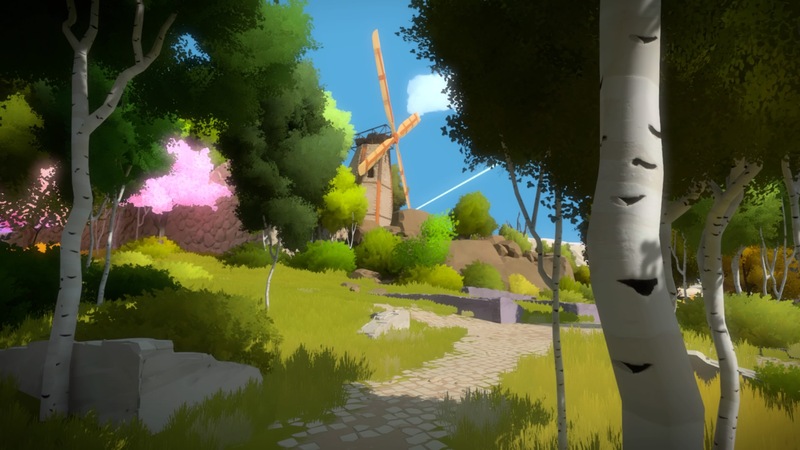 In The Witness, control simplicity helps you focus on the puzzles and the environment. By now you’re probably wondering: “But what about the puzzles?” The heart and soul of The Witness is solving puzzles and this is where it truly shines. The game features a nice mix of figuring out how puzzle mechanics work and then applying them in increasingly complex scenarios. Solving puzzles pretty much always results in a satisfying clicking sound and something activating or lighting up. That said, I should warn that there were a few puzzles that I found to be irredeemably bad. These were ones whose primary source of difficulty was that they were annoying or headache-inducing. Thankfully, cheap shots like that are very uncommon. We’re talking 2 or 3 out of hundreds, not nearly enough to mar an otherwise great experience. Puzzle game fans will be right at home with the challenge and the joy of epiphany that The Witness has to offer. 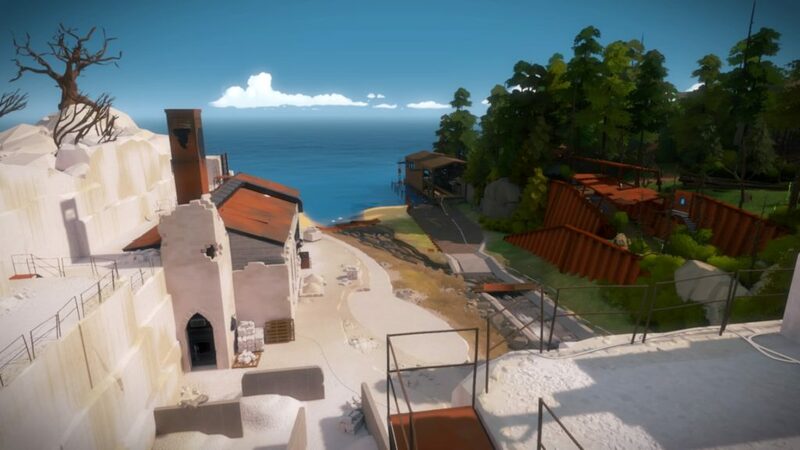 The open world design is one of The Witness’ more unique features, when it comes to puzzle games. Freely exploring the island gives players plenty of opportunities to encounter something, get stuck, and then return to it later with new understanding. The Witness imparts this wonderful feeling of always knowing a little bit more or feeling a little bit cleverer than you did half an hour ago. The island is more dense than it is big. There’s a lot to see, but I never found myself spending too much time just traversing ground to get somewhere (aside from a couple of out-of-the-way places and tricky extra content). The Witness released for $40 in a market where people expect indie games to launch at $10-20. So for many, a major concern will be: “Is it worth it? How much game am I getting for this price?” Well, regardless of how many hours you spend poring over puzzles, there is plenty of meat to this game and an enormous amount to discover beyond the basic requirements for completing the game. I honestly find it hard to imagine someone coming away from this game and saying “it was too short” or “there wasn’t enough to do.” If you’re into it, it’s very likely to satiate you. For fans of challenging puzzle games, The Witness will definitely scratch an itch. For those willing to dig deep into the game’s themes and symbolism, there may be yet more to love. There are occasionally times when the game’s difficulty can become infuriating, or when difficulty is introduced in a frustrating or annoying way, but it’s not going to ruin it for you. The Witness is not for everybody, but if you’re a fan of challenging puzzle games then you’re likely to have a good time exploring this enigmatic island.